The Deadpool 2 Super Duper $@%!#& Cut is available now on Digital Download and 4K Ultra HD & Blu-ray right now in the UK. 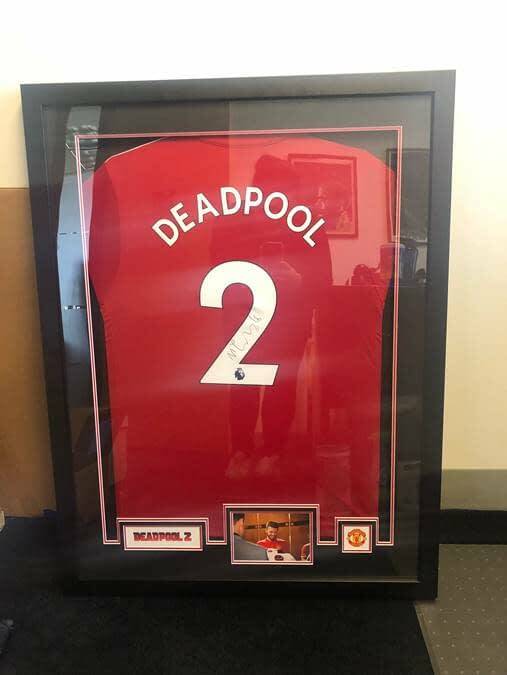 And in association with that, Bleeding Cool has a Manchester United Deadpool shirt signed by Michael Carrick, one of the Man U who appeared in this promotional Deadpool video. The shirt also comes with the frame and a photo inset of Carrick from the shoot. Have an address in the UK. We aren’t posting this abroad. Retweet and like the tweet associated with this article. Michael Carrick is a former professional footballer, best known for his 12-year tenure for Manchester United, which he also captained. A central midfielder, but he was used as an emergency centre-back under Alex Ferguson, David Moyes and Louis van Gaal. He currently serves as an assistant coach for Manchester United. He and Wayne Rooney are the only English football players to win the Premier League title, FA Cup, UEFA Champions League, League Cup, FA Community Shield, UEFA Europa League and FIFA Club World Cup. He was a member of the England squad for two major tournaments, the 2006 and 2010 World Cups. Deadpool is… Deadpool. Deadpool 2 is directed by David Leitch from a script by Rhett Reese, Paul Wernick, and Ryan Reynolds, with Reynolds starring in the title role alongside Josh Brolin, Morena Baccarin, Julian Dennison, Zazie Beetz, T.J. Miller, Brianna Hildebrand, and Jack Kesy. It has grossed over $734 million worldwide, making it the sixth highest-grossing film of 2018, as well as the third highest-grossing R-rated film and the third highest-grossing X-Men film. Everyone can agree that… it’s really gross. A sequel, Deadpool 3, is in development. Lea Swales from St.Ives, Cambridgeshire. Congratulations Lea.